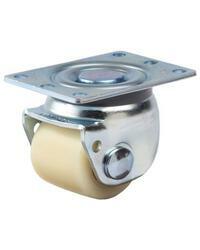 This low profile, high capacity top plate swivel zinc caster meets requirements where metric dimensions are preferred. It features a 2.36" diameter black nylon wheel. It's 3.4250" tall and has a 1322 lb load capacity. The wheel is of high-impact nylon and is resistant to chemicals and moisture. Applications include semiconductor equipment, heavy machinery, and medical equipment.